Search or browse below to find answers to common questions about MedAdvisor. Ask your pharmacist to provide you with an activation code which will give you access to your MedAdvisor account. More details HERE. Only a MedAdvisor network pharmacy can create an activation code to allow you to setup MedAdvisor. The code links your account to your historic and future prescription records - the pharmacy confirms the identity of your new account. You can use your activation code anytime within 10 days to setup your MedAdvisor account. To ensure security, your code will expire and be unusable after 10 days. If this happens, just see your pharmacist for a new activation code. Please see your pharmacist for a new activation code. MedAdvisor is FREE to users. Your pharmacy pays a monthly fee to provide MedAdvisor to you. You will need an email address to activate your MedAdvisor account. This is essential as MedAdvisor needs a unique contact for you to send critical messages, for example if you change your password. Your email address is also used as your unique username in the MedAdvisor system. You can easily create a free email account at Google, Hotmail, or Yahoo Mail. MedAdvisor attempts to retrieve your prescription history from the pharmacy that activates MedAdvisor for you, but some scripts may be missing (for example if you filled them at another pharmacy, or a non MedAdvisor network pharmacy). MedAdvisor can be assessed from ANY internet connected device, including smart phones, tablets, PC and Mac computers. We support a number of platforms including Apple products (iPhone, iPad) Android phones and tablets, or access via the internet and email. Please ask your pharmacist if you are unsure which is best for you. For Apple and Android mobile devices you can download the App from the Australian App Store. See HERE for details. You’ll need a Google account (Wallet or gmail account) to use the Google Play store. If you don’t have one, you can create one for free HERE. This is required to download and install anyApps for your device, so is worth setting up. You don’t need an App to use MedAdvisor. For other mobile devices, like Blackberry® or Windows® Phone, simply use your internet browser to login HERE. Download the medAdvisor App from the relevant App Store for your device (Apple App Store or Google Play Store for Android). Login with your username (email) and the password you elected when you first activated MedAdvisor. The MedAdvisor download size is approximately 15-20MB but can vary between devices. Yes, MedAdvisor can be accessed on ANY tablet device with internet access. For the Apple iPad, we recommend the iPad App available in the Apple App Store. For Android tablets, we recommend the Android App available in the Google Play Store. For other tablet devices (e.g. Windows tablets), access MedAdvisor in your internet browser HERE. The MedAdvisor system utilizes internet connectivity, so the mobile Apps will only function while you have internet access to your device (via Wifi, your telco’s 3G or 4G service, etc). No – your smart phone or tablet cannot receive notifications or messages without internet connectivity. When you move back into range, typically the relevant service (Apple Push Messaging and Google Cloud services) will push any outstanding messages to your device. This cannot be guaranteed by Apple or Google however – if you are out of range you may miss out on push notifications. If in doubt, start the MedAdvisor App and check your messages in the “Messages” page. MedAdvisor does not require the application to be running on your device to receive notifications. You can tap on notifications to open MedAdvisor. If you opt to access MedAdvisor via an internet browser, your messages will be sent to you via email. MedAdvisor meets all relevant Australian standards for the security and privacy of health and medical information. See HERE for details. Only you, and the pharmacists at your elected favourite pharmacy, can access your personal medication/prescription records. Your pharmacist will ONLY access your prescription records when they are helping you to setup or use MedAdvisor, or when dispensing new medication to you. MedAdvisor will only access your details to help you directly if you’ve contacted us requesting support and will only do so with your expressed consent. You own your own personal prescription data and account in MedAdvisor. Your prescription information is stored on secure cloud web servers located in high security Australian data centres. On the login screen, tap or click “Forgot Your Password?”. You’ll be asked to confirm your email address (your MedAdvisor username) and a new password will be emailed to you. MedAdvisor activation codes are only valid when used to activate an account along with your last name. They can only be used once – once your account is activated the activation code is discarded by the system. Thereafter your username (email) and password login credentials are required to access MedAdvisor. You should instead activate your account on your first device, then use your username (email) and password to log in to additional devices, as an existing user. You can login to medAdvisor on different devices simultaneously. Whenever you fill a script at a MedAdvisor-connected pharmacy, your account is updated with the details of that medication and script. Within 30 minutes your account will be updated on your mobile device or browser. 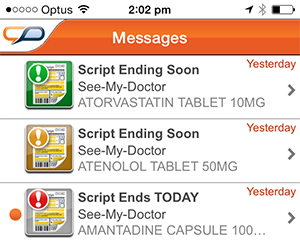 If the script is for a new medication, it will be added to your home screen, and a message will be sent to you. If the script is for an existing medication, the entry will be updated with your remaining Repeats Left, increased Days Supply Left, and possible updates to directions, brand name of medication and other changes. Yes – scripts filled at ANY medAdvisor network pharmacy (regardless of the group or brand of the pharmacy) will be added and updated to your medAdvisor account, even if the pharmacy is not set as your favourite. Your MedAdvisor account will not automatically update, so your Days Supply Left and Repeats Left numbers for that medication will be inaccurate. You can manually update your Days Supply figure to account for your new doses/packet by tapping the Days Supply figure on the Medicine Details screen. Your Repeats Left figure, and any missing medicines, will update correctly when you next fill the script at a MedAdvisor network pharmacy. Yes, but you must add ‘over the counter’ (OTC) products manually to your home screen. Scroll to the bottom of the home screen, and choose “Add Non-Prescription Med or Vitamin”. Enter a name, and the number of Days Supply you have for that product. You’ll be reminded to purchase more when you run out of that product. In your Home screen, under “Add Non-Prescription Med or Vitamin”, you can add these details. They will then appear in your Home screen. Note you won’t be able to access images or information about OTCs, and you won’t receive See-My-Doctor reminders as prescriptions are not required. You can easily increase the number of Days Supply you have for any medication, to reflect that actual total number of doses you have for that medicine. Tap on the medicine on the Home screen, tap on “Current Supply”, then tap the days of supply shown to edit – increase the days to match the total number of days of medicine you have left. You’ll need to take your additional prescription to your pharmacy. They can record the prescription as a ‘deferred script’ for later use. This will increase the “Repeats Left” number for that medication to include your additional script. You can easily cancel all reminders and remove a medicine from your medAdvisor account. On your Home screen, tap the medication to go to Medicine Details. Tap “Current Supply”, and tap the button “I’ve Finished Taking This”. Confirm this and the medicine will be removed from your Home screen. All reminders will be cancelled. This reminder system is called the Fill-My-Script feature. If your Days Supply Left for any medication drops to only 5 days supply remaining, medAdvisor will send you an initial reminder with title “Supply Running Low” . If you still haven’t filled your script on the day you’ll run out of that medication (0 days supply remaining) you’ll get a further reminder “Supply Runs Out TODAY” . You should fill your script urgently to ensure you don’t miss doses. If you don’t fill the script MedAdvisor will chase you one last time, 3 days after you ran out of supply. “Supply Refill OVERDUE!” . You need to fill your script immediately and should seek advice from your doctor or pharmacist as to the impact of missing your dose for the past 3 days. If you’re no-longer taking a medication, you should remove the medication from medAdvisor as described above. This reminder system is called the See-My-Doctor feature. MedAdvisor reminds you to see your doctor in different ways, depending on the type of medication. Depending on the advice given by your doctor and pharmacist you may need to see your doctor for a new script, to check your progress or provide other treatment. Tap the medication on the Home screen. 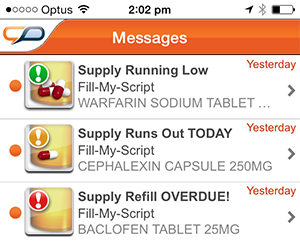 Tap “Scripts and Repeats” on the Medicine Details screen. Then tap “I Have A New Script”. MedAdvisor will not send you any more reminders until after your next fill your script. Only the latest Fill-My-Script or See-My-Doctor reminder message for each medicine is kept in your inbox. Only the latest message is relevant and accurate. Old messages are superseded by the latest message for that medicine, and are removed automatically. Choose “Take My Meds” from the main menu, then tap on one of the standard reminder spots, Breakfast, Lunch, Dinner or Bed Time to edit the time-of-day for that. This will take you into the Edit Alert screen where you can amend the Time (tap the time to change). Press Save on the top right hand side and the reminder time will be updated. Choose “Take My Meds” from the main menu, then tap on the “+” button in the top-right corner of the screen. This will take you into a “New Alert” screen, where you can add your extra reminder time. Enter a name for the new Take-My-Med reminder, choose the time, and use the Days option to elect either daily or weekly reminders. MedAdvisor can be used in addition to your dose administration aid. MedAdvisor's advanced features will assist you in understanding and managing your prescriptions. MedAdvisor provides reminders and other features not covered by your dose administration aid. Please refer to our detailed knowledge base article, by clicking here. Your ‘favourite pharmacy’ should be set to the MedAdvisor pharmacy that is local/convenient to you, where you fill the majority of your prescriptions. Your favourite pharmacy’s details and logo appear in many points in the MedAdvisor application, and Tap-To-Refill requests and messages are passed to your favourite pharmacy. By default your favourite pharmacy is set to the pharmacy that initially created the activation code to activate your MedAdvisor account. A MedAdvisor network pharmacy is any pharmacy that is connected to the MedAdvisor network. Look for the MedAdvisor logo in their window, at the dispensing counter, or ask the pharmacist if they are part of the MedAdvisor network. Yes. Your elected favourite pharmacy can see your personal MedAdvisor prescription record and settings. They will only look at your prescription details to assist you in your use of MedAdvisor and to help you manage your medications. Pharmacies can look up all records of your prescriptions in their dispense system, and will always treat your personal prescription records with respect for your privacy. To change favourite pharmacy, search for a new MedAdvisor network pharmacy in the Pharmacy page of MedAdvisor, using the “Nearby” or “Search” tools. Once you find another pharmacy you’d like to make your new favourite pharmacy, scroll to the bottom of their contact details and tap the “Set As Favourite Pharmacy” button. You’ll also need to take all your prescriptions to your new favourite pharmacy to allow that pharmacy to fill your Tap-To-Refill requests before you arrive in the pharmacy. The Nearby and Search tools will only show MedAdvisor network pharmacies, where the MedAdvisor system is supported. By using only MedAdvisor network pharmacies, you can be sure that all your prescription records will be kept up-to-date and accurate in MedAdvisor. From the menu, select “Pharmacy”, then you will be taken onto the Pharmacy screen. Here select the “Nearby” tab. A list of pharmacies close by will be shown. Select a pharmacy to view their details, with options to “Call”, “Show on Map” or “Set As Favourite Pharmacy”. Alternatively you can search using this page. It is recommended you leave all your scripts with your favourite pharmacy for safe keeping and rapid dispensing. By leaving your “Scripts on File” at your favourite pharmacy, your pharmacy will be able to prepare your medication in advance of your visit, when you order using the “Tap to Refill” feature in MedAdvisor. That way you can avoid the wait at the pharmacy! The majority of MedAdvisor features will still available. Tap-To-Refill will not be available however, as your pharmacist needs your paper scripts in-hand to prepare your medication. If the new Medicare card is simply a replacement issued when your old card expired, you do not need to inform your pharmacy. MedAdvisor will continue to be updated when you fill new scripts. (If the new Medicare card is a replacement due to expiry, you’ll notice that only the last digit of the Medicare number changes. The rest of your Medicare number will stay the same). If however you’ve been issued with a totally different/new Medicare number, which often happens when your family structure changes (family members added or removed) your pharmacy will need to record your new number to ensure uninterrupted operation. If in doubt, see your pharmacist and show them your new Medicare card. In version 2.1 of MedAdvisor you can utilize “Carer Mode” to attach other family members to your MedAdvisor account, and manage multiple peoples’ medications in the one place. If you have internet access via a smart phone, tablet or PC internet browser you won’t need SMS reminders anymore. If you currently receive SMS reminders you can ask your pharmacist to disable them. MedAdvisor provides a more complete feature set and more detailed messages than SMS reminders. See HERE for a full feature list. If you choose to Logout, you will no longer receive any push notification reminders on your device. Leave your account logged in to ensure you receive important notifications and messages. GP Link is MedAdvisor’s new script renewal service, allowing you to request a script renewal (also referred to as a ‘repeat prescription’) directly through the MedAdvisor app and website from an Australian certified and registered doctor. That doctor can be your regular doctor, where they have signed up to be part of MedAdvisor’s GP Link service, or, where your regular doctor is not available, you can choose to request a script renewal through the MedAdvisor app and website from an On-Demand GP. GP Link is not designed to replace the important discussions you have with your regular doctor in person. Rather, GP Link has been designed to help you digitally connect with your regular GP to ensure you can have a continued supply of your current medications. Once you have submitted a script renewal request through GP Link via the MedAdvisor app or via the MedAdvisor website, your chosen doctor will receive your request and respond within two business days where it is your regular doctor, or within one business day where you have chosen the On-Demand GP. (c) decline your request. Where the GP is unable to approve your request via GP Link, you will not be charged, you will be provided with the reason for your request being declined and you will be directed to see your regular doctor for an in-person consultation. Where your script renewal request is approved, you can have your prescriptions mailed directly to your favourite MedAdvisor pharmacy or to another mailing address. Where you have used your regular doctor, you can also choose to pick them up directly from your regular doctor’s medical clinic. GP Link is not covered by Medicare and therefore there will be an out of pocket fee for this service. Fees may vary by doctor and may be dependent on the number of medications requested. The cost for the On-Demand GP service is fixed at $19.95 for first script plus $5 per additional prescription. You will always be made aware of the total fee payable prior to submitting your request. The GP Link service allows you to obtain script renewals for medication that you have previously been prescribed, without having to physically visit the doctor. This not only saves you time but also supports you in continuing to take medications as prescribed and intended by your regular doctor. The doctor who reviews your request will use their clinical judgement to determine if it is appropriate to provide repeats for the script. The GP Link service is designed as a bridging service and not a service intended to replace the important discussions you have with your regular doctor in person. Doctors are able to join GP Link for no charge and our aim is to have as many of our customers’ regular doctors available via GP Link as possible. If your doctor is not on the list, but you would like them to join, please email us with their details here and we will invite them to join. MedAdvisor requires you to choose a favourite pharmacy. If you are not sure how to do this, find out here. When requesting for a remote script renewal from your regular doctor you will generally receive a response within 2 business days. If you request a script from an On-Demand GP, you will generally receive a response within 1 business day. MedAdvisor will alert you when a remote script request has or has not been approved. Delivery time for scripts can vary and will depend on standard Australia Post delivery times..
We currently accept all major credit cards (M/Card, VISA, AMEX). You will only be charged when the prescribing doctor approves your request and issues the prescription. You will be sent a notification by MedAdvisor when the scripts have arrived at the pharmacy. The number of repeats remaining for the medications will update on the MedAdvisor home screen, and you will be able to place a Tap-To Refill order. All doctors in the MedAdvisor network are registered in Australia and certified by Australian standards. All doctors must be fully insured. The prescribing doctor will maintain records as per Australian requirements and MedAdvisor will not be keeping copies of these reports. © 2019 MedAdvisor International Pty Ltd. All rights reserved.